This month ILSPA has the pleasure of catching up with a former student of ours, Melinda Toth. Melinda enrolled for our Legal Secretaries Diploma course last year and after successfully completing her qualification in early 2018, went on to secure her very first Legal Secretary role not long after with MW Solicitors. 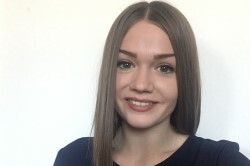 We had a few questions for Melinda about how she found her qualification, and what advice she would give to recent graduates of the course when starting their Legal Secretary job search. What was the reason you decided to train to become a Legal Secretary? I have always been interested in the legal field, and I thought the best way to get started was by becoming a Legal Secretary, and later on qualify if I felt like that would be the right thing to do for my career. How do you feel ILSPA's Legal Secretaries Diploma prepared you for working as a Legal Secretary? I feel like this course has given me all the knowledge and confidence I need to go for an interview and get a position as a Legal Secretary, and I will definitely pick up the pace and everyday routine easier once I start, and that’s all because of the things I’ve learnt in this course. Did you take advantage of ILSPA's CV advice and guidance to secure employment? Could you tell us about your new role? I will be working as a Litigation Legal Secretary at one of the offices of MW Solicitors. What made you want to apply for this position in particular? Out of all the different fields in law, I am most interested in litigation. They are also a very friendly and approachable firm, so I felt like they could provide a great environment for learning and growing into the position. They also seem very understanding, which will come in handy during the initial learning/training months. What advice would you give ILSPA graduates who are just starting their job search? I would say you have to be confident and proud of the knowledge that you’ve gained through this course, as that’s what sets you apart from all the other applicants. If you show enthusiasm and interest in the role during your interview, that will come through in a very positive way, and you might just end up getting the job! And if not, don’t give up, just use that interview as a lesson and keep trying. You will eventually find a place that will give you a chance and you can start off your new, exciting career as a Legal Secretary! Thank you to Melinda for taking the time to speak to us and answer our questions. It is always wonderful to catch up with our former students and hear about how their careers have progressed. If you are interested in studying to become a Legal Secretary like Melinda, please take a look at our course page. Students receive one year’s free Membership as part of their enrolment, which includes the use of our guidance to secure employment and CV help service. To find out more about our Membership Benefits and how we can help you with your career, take a look at our Membership page.